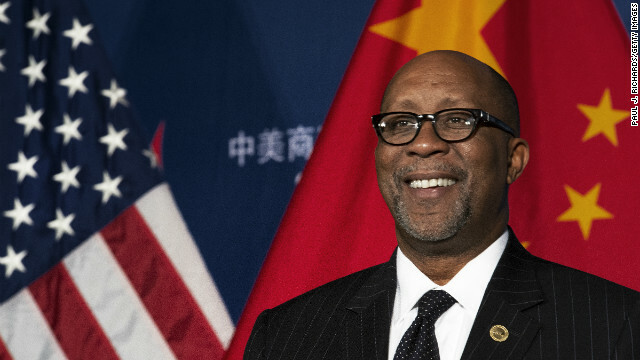 (CNN) – Ron Kirk, the United States trade representative, will step down in February, his office announced Tuesday. Responsible for developing and recommending American trade policy to the president, the trade representative is a Cabinet-level position, though isn't officially within the president's Cabinet. "It has been no less than my greatest professional privilege to serve President Barack Obama alongside the dedicated professionals of USTR," Kirk wrote in a statement. "Together, we have made great strides to bring about the President's vision of a more robust, responsible, and responsive trade policy that opens markets to products stamped 'Made-in-America' and enforces Americans' trade rights around the world – and does so in a way that is more consistent with America's core values on issues like the rights of workers and the environment. Kirk, an African-American, departs Obama's cabinet as some critics have questioned why Obama's second-term appointments have all been white males. Among his achievements in the office was shepherding the implementation of long-term trade agreements between the United States and Korea, Colombia, and Panama that originated during George W. Bush's administration. "There’s no question Ron delivered results for the American people and for our economy," Obama wrote in a statement thanking Kirk. "From bringing home new trade agreements with Korea, Colombia and Panama and negotiating to open up new markets for American businesses, to cracking down on unfair trade practices around the world, he has been a tremendous advocate for the American worker." A former mayor of Dallas, Kirk was sworn in as trade representative in March, 2009, after winning Senate confirmation despite a revelation that he had failed to pay some federal taxes. A Senate Finance Committee review of Kirk's returns found that he had failed to report as income $37,750 in honoraria collected for 16 speaking engagements between 2005 and 2007. One year, he deducted honoraria from four events as charitable donations though he hadn't reported them as income, according to the committee report. He also deducted too much for the cost of tickets to see the NBA Mavericks, reporting the entire $17,382 as business expenses, the report said. Kirk subsequently paid the $9,975 he owed from amended returns. The Senate voted to confirm Kirk by a vote of 92-5. The former mayor, who took office at a time of rising trade tensions with Mexico, promised to help strike a new balance between a commitment to free trade and concerns relating to environmental and labor standards. He's stepping down. I'm curious to know what that has to do with President Obama and his Cabinet?? Why doesn't the news simply report news anymore?? Why do they have to put their spin on everything?? My goodness the first person he wanted in his Cabinet was a black woman but the GOP shot her down quick, yet the media keeps talking about his all white all male Cabinet. Shouldn't he be allowed to pick who he wants in his own Cabinet or is that right reserved for the GOP? What has happened to our news sources. I bet Walter Cronkite is doing back flips in his grave.